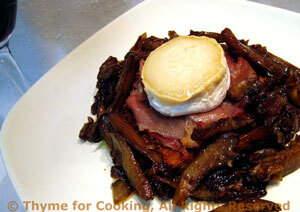 Goat Cheese, Prosciutto with Wild Mushrooms, Thyme for Cooking, gourmet. The pungent goat cheese, salty ham, sweet shallots and woodsy mushrooms combine to taste like autumn. The chevre for this should be a log that is aged. That means it will have a thin, edible rind and can be sliced easily. You can use a soft goat cheese, it will just melt faster and be a bit harder to work with. Slice shallots about 1/4" (.5cm) thick. Add water (it helps speed things up and prevent burning), stir well and cook for about 20 minutes, stirring occasionally, until nicely browned. Turn heat to low if cooking too hard. Add brown sugar, vinegar, sage, and cook, stirring for 2 more minutes. Heat oil and Worcestershire sauce in the same skillet. Add mushrooms, and stir well to coat. Sauté over medium heat until mushrooms are nicely browned, 10 - 12 minutes, depending on type and size. When done add the caramelized shallots and stir well to combine. Keep warm. Put bread rounds on a baking sheet. Divide mustard and spread on the bread. Arrange the Prosciutto on top of the bread. Place one slice of cheese on top of the Prosciutto. Broil just until cheese starts to melt, 45 - 60 seconds. Remove and put on plates. Spoon the mushrooms around the toasts, drizzle with oil if using, and serve.